Enough with the turkey! I have been craving seafood after all this Thanksgiving fare. Last night I made this ridiculously easy salmon and it didn't disappoint. The brown sugar locks in the moisture, leaving me a juicy, flavorful piece of love. I served with these sweet potatoes. Also, Old Bay is having another great giveaway. Become a fan of their Facebook page and you can win all sorts of goodies by uploading a picture of your holiday feasts. 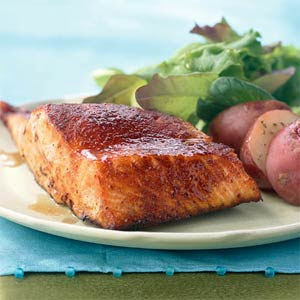 Simply coat both sides of a skinned salmon fillet with brown sugar (coat liberally) and sprinkle Old Bay Seasoning (be generous) on top of the brown sugar. Wrap in foil packet and bake for 30 minutes on 350 or until it flakes easily.